Happy Earth Day! It is so glorious outside right now, it is like the Earth is celebrating her big day along with us. The smell of new honeysuckle is wafting through the open windows. Yum. I'm happy to report our family has made some good strides towards becoming green. We are now using cloth napkins almost exclusively along with reusable snack bags. I have curbed my driving so that instead of filling up my gas tank every 3 weeks, it is every 5 weeks. We finally have recycling pick up offered in our area and that has cut our trash in half. I love to give Lydia cereal boxes to jump on to crush and then walk her out to the recycle bin. I recently found out that you use 8 times as much water to wash dishes by hand as in the dishwasher, so that was a freebee. I hate washing dishes by hand. My next move it to get rid of the plastic store sacks. Did you know that the average American family consumes over 2,500 plastic sacks a year! Yikes! That can't be good. My goal is to stock up on those $1 grocery totes and actually take them with me to the store. Along with that, I want a really stylish tote to always have with me when I am running errands. I'm loving the "Bag Envy" tote from Green Eyed Monster. Stylish, practical and gets the point across. Also, the simple "live enviably" tote is on sale for $10!! 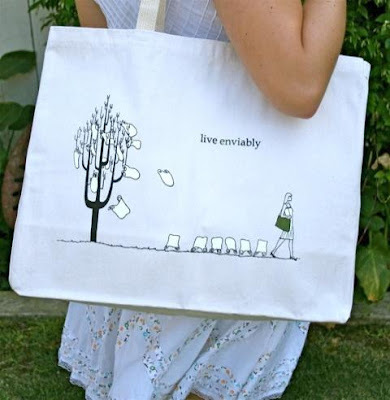 I saw on Twitter and facebook that you can win a Bag Envy tote for yourself. I know, leave it to me to see Earth Day as a reason to go purse shopping. But hey, it's for the planet! What are you doing to go more green? And don't forget, it matters WHERE your bag comes from - those $1 bags are made in 3rd world factories out of totally non-recyclable stuff and don't last terribly long. Green Eyed Monster totes are 100% post-consumer recycled cotton (so they're not making anything new in the world), in New Hampshire, by an all-woman run manufacturing company, and screen printed by hand. Wee! 360 degrees of green! I have an organic garden and am hoping to supply most of my families veggie needs without any shipping of produce this year! I've been using the reusable grocery bags for over two years, and have now added in the tote bags for my other shopping. Sometimes I have to get a few bags (target is the best) for my small garbages, but that's reusing too! I'm onto cloth napkins and snack bags, and I try not to buy juice boxes or other bulky one-time use packaging. But I could not go 5 weeks without filling up my car! That's amazing. I just made some cloth napkins for us to use. So many papertowels in our house! Yes Molly, you've always been a tread setter. The grocery bag thing is something I have been wanting to do for a while. I just can't seem to get it going! I want to make some... but maybe I should just buy them. Maybe that would solve my problem. Revelation! good for you. We're trying to be very "green" as well. At first I took great pride in how much I recycled but now I realize I need to stop and look at reducing the amount of packaging I purchase even if it can be recycled. It's gonna be a long work in progress! Love the photos on your site!